The Syrian warplanes pounded the strongholds of Al-Nusra Front terrorist group in the province of Lattakia over the last 24 hours, killing tens of terrorists and injuring dozens more. The Syrian army destroyed the vehicles and wireless communication station of the terrorists in Rabi’a and Dweirshan regions. Several foreign terrorists, including a Saudi named Abu al-Muslimeen, a Pakistani named Saqr al-Aboud and another foreign national Mus’ab Saji were identified among the terrorists killed in Lattakia province. Also in the past 24 hours, the Syrian army and Hezbollah forces killed several Takfiri terrorist commanders and destroyed an IED (improvised explosive device) manufacturing site in the city of Zabadani in Damascus province. Four Takfiri terrorist leaders named Khaled Omar, Ebrahim Javish, Besam Hazima and Abu Ahmed Ziyad Nassif were killed in heavy clashes with the Syrian troops today. The Syrian troops and resistance forces also destroyed an IED-manufacturing workshop in Barda street of Zabadani during their mop-up operations in the strategic city. Meantime, tens of militants of Jeish al-Islam terrorist group surrendered to the government troops in the city of Zabadani. Syria’s National Reconciliation Committee announced today that a large number of militants laid down arms and surrendered to the Syrian authorities. A number of senior commanders of Jeish al-Islam have also surrendered themselves to the Syrian army in Zabadani. The development came after President Bashar al-Assad in a televised address last month pardoned all soldiers who have fled the army, saying that his words served as a general decree to relevant officials. Elsewhere, the Syrian army pounded the positions of the Takfiri terrorist groups in the Northern parts of Syria, forcing the Al-Nusra Front terrorists to withdraw from Aleppo countryside. The Al-Nusra Front terrorists withdrew from Azaz, Shuarqa al-Arz, Al-Qanbariya and Al-Malekiya regions in Aleppo countryside. Terrorists of al-Nusra Front also suffered losses in personnel and equipment during special army operations against their concentration centers in the vicinity of al-Nairab airport in the Southeastern countryside of Aleppo. Meanwhile, the army destroyed positions of al-Nusra Front-linked terrorists in the neighborhoods of Bani Zaid, al-Salehin, al-Khaldiyeh, al-Shaar, Alliramoun, Bustan al-Qasr and al-Rashideen in Aleppo city. Also, militants of the ISIL Takfiri terrorist group abducted 230 civilians, including at least 60 Christians, in a Central Syrian town. 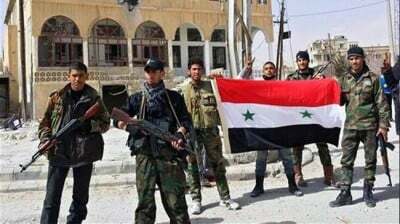 The so-called Syrian Observatory for Human Rights said the civilians were taken on Thursday in the town of Al-Qaryatain. “The ISIL terrorists kidnapped at least 230 people, including at least 60 Christians, during a sweep through Al-Qaryatain,” Observatory chief Rami Abdel Rahman said. Many of the Christians had fled from Aleppo province, in Syria’s North, to seek refuge in Al-Qaryatain. He said those abducted were wanted by the ISIL for “collaborating with the Damascus government,” and their names were on a list used by the Takfiris as they swept through the town. Families who tried to flee or hide were tracked down and taken by the Takfiris, he said. Al-Qaryatain lies at the crossroads between a territory controlled by the ISIL in the Eastern countryside of Homs and areas further West in the Qalamoun area. It had a pre-war population of 18,000, including Sunni Muslims and around 2,000 Catholics and Orthodox Christians. According to a Syrian Christian who lives in Damascus but is originally from Al-Qaryatain, the town’s Christian population has dropped to only 300. In May, masked men abducted Syrian priest Jacques Mourad from the Syriac Catholic Mar Elian monastery in Al-Qaryatain, near the ISIL-captured ancient city of Palmyra. Mourad, who was known to help both Christians and Muslims, was preparing aid for an influx of refugees from Palmyra.